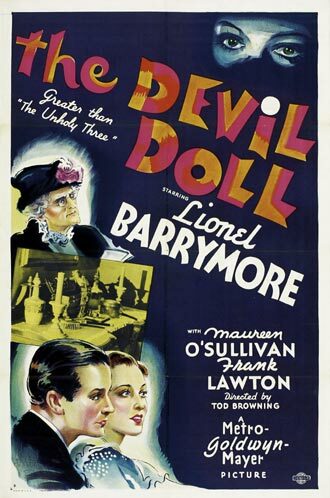 A falsely accused convict on the lam (Lionel Barrymore) collaborates with a mad scientist (Rafaela Ottiano) in using miniature “live” dolls to seek revenge on his three ex-partners. In his brief review of this “unsettling” horror flick — directed by Tod Browning and co-written by Erich von Stroheim — Peary notes that the special effects are “good”, pointing out that when Barrymore uses mind control to send the “doll people” (Grace Ford and Paul Foltz) to “sneak through [the] houses [of his ex-partners], they’re like wily rodents or insects on the loose — they’ll give you chills”. I would argue that the effects are more than merely “good”: they’re actually quite impressive, given that the miniaturized humans blend seamlessly into their life-sized surroundings, through the creative use of both travelling mattes and over-sized sets. Peary also neglects to mention in his review how effective Barrymore is in the plum central role, as a righteously vengeful fugitive who spends most of his screen time in convincing cross-dress as “Madame Manderlip”; to that end, the make-up department on the film set deserves special mention as well. Also memorable (if a tad one-note in her performance) is “crazed” Ottiano, with a wild streak of white running through her hair, reminiscent of Elsa Lanchester’s iconic “bride of Frankenstein”. Her presence here is refreshing simply as one of cinema’s few female “mad scientists” — and her obsession with making all living creatures tiny borders on ludicrously campy, allowing for a surprising twist of tension in the final act of the film. While the narrative gets bogged down occasionally by a sappy, Stella Dallas-esque backstory involving Barrymore’s attempts to befriend his estranged adult daughter (Maureen O’Sullivan), there are enough surreal, chilling elements throughout this memorable film to make it a minor cult classic. Film fanatics should take note that several of the story’s central elements are evident in both Browning and von Stroheim’s earlier efforts: Browning’s The Unholy Three (1925) featured Lon Chaney in drag as a wily old woman, for instance, while von Stroheim’s The Great Gabbo (1929) dealt with a human-like ventriloquist’s doll. Yes, as an enjoyable cult horror classic. It seems to me one has to be a little patient when ‘TDD’ starts out. The film doesn’t seem promising when it begins; it throws out the scent of a “mad scientist” flick that threatens to give the sub-genre a bad name. In short, it comes off as amateurish. But things improve soon enough – esp. once we learn what Barrymore intends to do. Aside from its slightly shaky opening, I don’t think the film gets bogged down at all. As things progress, we witness how effective Browning is in directing naturalistic scenes and those focused on normal human emotion, as well as the bizarre centerpiece that epitomizes the director’s bread-and-butter. No doubt about it, this is one uniquely weird flick. But it’s also rich, and a bit of a wild ride for the viewer.